Gourmet jams and frozen berries for the retail trade. Blåtand supplies retailers with gourmet jams and individually frozen berries for consumers who appreciate the finer things in life. Our jams are noted for their high berry content and whole berries. Tastefully presented in glass jars with fabric covers, Blåtand’s Swedish gourmet jams are for the discerning customer. Our lingonberry, bilberry and cloudberry jams with whole berries and a high berry content of 65-70% are carefully prepared to traditional Swedish recipes and are ideal for shops looking for quality products and customers looking for the very best. We also offer a range of attractive gift packs that stand out on the shelf and make ideal gifts for both private and corporate customers. 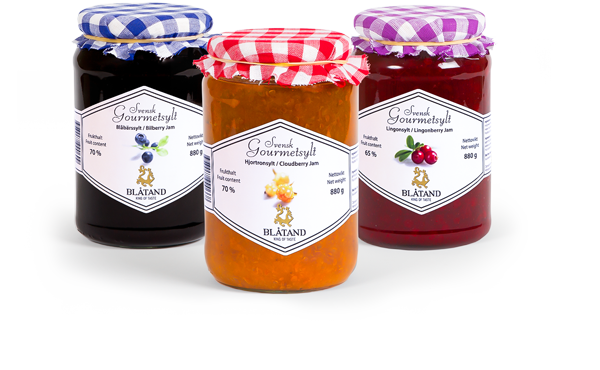 Bulk packs of jam for large families (2 kg tubs) with a 60% berry content are also available, as well as Blåtand’s individually frozen berries, which are renowned for their high quality and nutrient content. Vi erbjuder även andra volymer/förpackningar vid förfrågan.